Hannibal crosses the Alps - Because of the loss of its navy after the First Punic War, Carthage had no way to invade Rome by sea. So Hannibal was forced to choose a different route; and the only route available was over the Alps. He began with about 90,000 infantry, 12,000 cavalry and thirty-seven elephants. 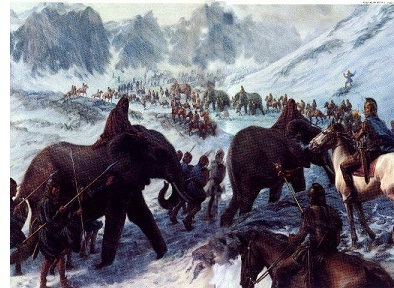 The trek took about two weeks and Hannibal lost more than half his army along the way. Nonetheless, he made it over the highest mountain range in Western Europe and proceeded to invade Italy from the north beginning in 218 B.C..